Confession: This is the first book by Roald Dahl I've ever read. Of course, I'm familiar with his stories, and I have a vague recollection that my mom might have read James and the Giant Peach aloud, but I honestly can't remember. 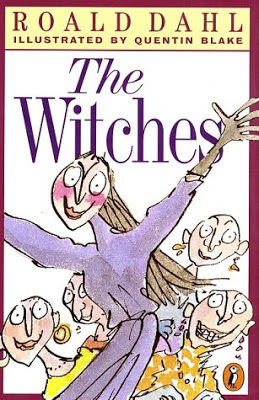 So I am counting this reading of The Witches as my first real exposure to Roald Dahl. I can assure you, it won't be my last. When I first had the idea to read this for Halloween, I gave no thought to the possibility that I might actually enjoy it, only that it was a perfect book for October. But I honestly had not even listened to a minute of it before I was hooked, and more than once I thought, I can't believe I'm enjoying a book about witches so much. The story is narrated by a young boy who goes to live with his Norwegian grandmama following the death of his parents. His grandmother is an authority on REAL witches...those dangerous creatures who masquerade as kind and sweet women. All witches hate children, and it is their life's work to dispose of as many of them as possible. After warning him and sharing a few tales of other children's disappearances, the grandmother gives him a few tips for recognizing a witch in normal, everyday life (for example, a witch will always be wearing gloves to hide her claws). The boy takes this advice and manages to escape the tactics of a witch who tries to lure him out of his treehouse. But a few weeks later, he finds himself trapped in a hotel ballroom with not just one, but nearly a hundred witches, including the Grand High Witch herself. In the beginning, I thought the narrator was a girl. I don't know if this was because the audio was read by a woman or if there was some other detail that turned me in that direction. So it was rather a rude awakening when a couple chapters in, I realized the story had been about a boy, not a girl, all along. It took me a moment to make the mental switch. I guess that's one good reason to read the jacket synopsis ahead of time. The writing was delightful: just the right mix of humorous and frightening. When the boy (sorry, I would call him by his name, but it is never mentioned), gets trapped in the aforementioned ballroom, I literally felt the terror creep over me as he looks around the room and takes note of the gloves and the wigs and all the other things his grandmother warned him of. Even though I knew all along that the "Royal Society for the Prevention of Cruelty to Children" was really going to turn out to be a meeting of murderous witches, it did nothing to lessen the goosebumps that prickled my skin when the Grand High Witch took off her mask. Mixed with some funny characters and incredibly witty lines, the whole story was thrilling. The audio was read by Lynn Redgrave, and, as you might expect, she was fantastic. Oh, she was so good: the grandmother's Norwegian accent was charming (I couldn't help but say, "My darling" just like she did anytime I talked to my boys), the Grand High Witch's voice was grating and obnoxious, and there were times when the boy was so delighted by something that I could literally hear the smile in the words as she spoke them. The whole time I was listening, I kept thinking about how much fun it will be in a few years to read this out loud to my boys, but now the audio has ruined that for me. Much as I love reading out loud, I could never do this story justice the way Lynn Redgrave does. If you haven't had the pleasure of reading this book, or even if you had, read it this month! It's a fast read, and it will get you in the mood to go trick-or-treating. And, um, it will also make you look at your nice elderly neighbor with a discerning and wary eye. You just never know what's behind that sweet face! I was vaguely familiar with Dahl's work, but really came to enjoy him when I was teaching 5th grade. They make fantastic read alouds, and ALL my students enjoyed them :) He's so clever. Esio Trot ("tortoise" spelled backwards)is a good quick read, as is George's Marvellous Medicine. Maria, I'm anxious to try more of his books. Thanks for the recommendations...I feel like teachers are the best resources because they really know what kids do or don't like. Thanks for your comment! Sometimes I feel like a bad person because I've never been a huge fan of Dahl. It seems like all the big time children's lit people adore him and everything he's written. I think James and the Giant Peach just gave me a bad taste for him when I was a kid. I'll have to give The Witches a shot! I love Roald Dahl. Matilda and Charlie & the Chocolate Factory are two of my favorite read-alouds. I haven't read The Witches, though. My sister and I grew up loving the movie, starring Anjelica Huston as the Grand High Witch. My daughters enjoyed it, too, but they seem to love everything Dahl they've been exposed to. Matilda is one I've been wanting to read for awhile, and since I enjoyed this one so much, I'm anxious to get to it! If you read The Witches, I'll be interested to hear how you liked it! ha ha! I have never read a Roald Dahl either. What are the odds! We actually saw this book a Value Village a few weeks ago and almost got it cause Tim had seen the movie years ago and thought it might be good. Now I wish I had. I do love Lynn Redgrave although we listened to her read Prince Caspian and I had a hard time with the fact she was female since most of the characters are male in that one. I bet she'd be great for this one though! I'm a huge fan of Dahl's books. I hope you try some more! Matilda and BFG are both incredible.